This film has been getting mixed, but generally positive, reviews. With the dearth of decent movies out right now and an overwhelming amount of dreck, it's been a while since I've been in the theater. So I decided to chance Michel Gondry's latest indie creation (he wrote and directed this film as well as The Science of Sleep and directed Eternal Sunshine of the Spotless Mind) starring Jack Black and Mos Def. It is sweet, funny and genuinely touching--and sports numerous whimsical visual touches that are Gondry's trademark. 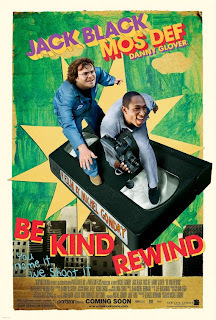 The clever premise--Jack Black's off-the-wall character of Jerry gets magnetized and accidentally erases all the tapes in Mr. Fletcher's (Danny Glover) hole-in-the-wall video rental store causing Mike (Mos Def) to enlist Jerry and other locals to film their own twisted re-enactments of the originals--is wacky but accessible. Who didn't grow up putting on shows, singing songs into a tape recorder, creating whole worlds out of construction paper and cardboard boxes? But more than just an homage to the individual creative spirit, Gondry salutes the power of the story and the storytellers. Especially in the medium of film, storytelling becomes a collective and collaborative process--both in its production and the experience of viewing it. Not only is Gondry able to capture the magic that is telling a story, but he charmingly conveys how a story told with passion and conviction can enchant even the most disillusioned of audiences. It is a cry out against today's corporate movie-making process to offer something more than the usual slick, formulaic studio film and instead find ways to truly enchant and engage the audience. Because creativity begets creativity--and as humans, we crave to be informed, enlightened and entertained.